I bought myself an early birthday/Christmas gift last month. Usagi Yojimbo: The Special Edition [Fantagraphics; $74.99] is a glorious, two volumes in a slipcase collection of the entire Fantagraphics run of Stan Sakai’s wonderful stories of a rabbit ronin in feudal Japan. These two volumes have well over a thousand pages of comics plus lots of cool extras. Usagi is one of the truly great characters in comic books. If I had to name my top ten favorite comics characters, he would have a good shot at being on the list. His adventures combine action, emotion, humor, historical adventure and fantasy. He’s one of those heroes who lends himself to almost any kind of story and can take a back seat to supporting characters when a story demands it. I have been a fan from the start. 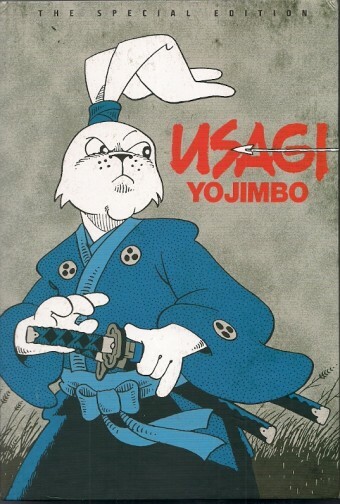 Whenever I looked at ways to downsize my Vast Accumulation of Stuff – too big and too disorganized to be called a proper collection – I never for a moment considered selling my Usagi Yojimbo comics. If I ever do sell them, it will be because I have all the stories in collections. I look forward to that future time when I have all the collections lined up on a bookshelf in a place of honor. Stan Sakai is one of the truly great creators in comics. He writes, he draws, he letters…and does each of those as well or better as anyone else in comics. I am frequently amazed at how much humanity he brings to his anthropomorphic characters. I am no longer amazed by how deftly he merges words and drawings to create his stories. I can read his comics for the pure enjoyment of it and I can study his comics to see how I might attempt, however poorly, to bring a bit of that magic to my own stories. I am looking forward to reacquainting myself with these earliest of Sakai’s Usagi Yojimbo adventures. Once a year, as my own personal advanced comics studies, I read Bill Watterson’s Calvin and Hobbes from start to finish, a couple weeks per day. In 2016, I’m going to be doing that with Usagi Yojimbo. I don’t think I can give my pal Stan any greater praise than that. Usagi Yojimbo: The Special Edition is not an inexpensive purchase, but it’s well worth it. If you buy no other collection this holiday season, buy this one. 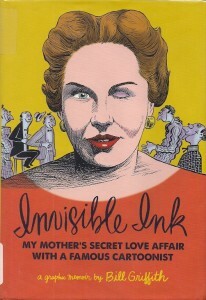 Invisible Ink: My Mother’s Secret Love with a Famous Cartoonist by Bill Griffith [Fantagraphics; $29.99] is yet another late-in-the-year contender for best graphic novel. However, I’m not sure that “graphic novel” is the right term for the book, since this is not a work of fiction. It’s the true story of Griffith discovering his mother had a long-running affair/romance with cartoonist and writer Lawrence Lariar, a man who Griffith had met and whose work he was familiar with. Talk about an emotional revelation. Griffith is best known for Zippy the Pinhead and underground comix work. In Invisible Ink, he barely touches on his own comics career, concentrating instead on his family history, his relationships with family members and his mom’s secret life. By his accounts, Barbara Griffith was a smart and talented woman. She was a writer and sold a number of stories during her life. She worked closely with Lariar on his mystery novels, several of which had for their protagonist a comic-strip writer. She kept her passion for Lariar secret from her family and almost all of her friends, but her affair with him was fiery and romantic. She loved him and that’s one of the truths Griffith must accept and try to understand in this book. I’ve enjoyed much of Griffith’s work over the years, but Invisible Ink is his greatest work. Without being flashy, it draws the reader into the artist’s world. It makes us feel as if we were part of his family. It makes us wonder, as Griffith does, what twists his life and work might have taken if Lariar and his mom had divorced their spouses and married. It’s a engaging story, all the more compelling because it is a true story. Sidebar. Lariar wrote four novels featuring Detective Homer Bull, the comic-strip writer: Death Paints the Picture, He Died Laughing, The Girl with the Frightened Eyes and Friday for Death. All of them are currently out of print. I love to see Fantagraphics or another publisher release new editions of them. Invisible Ink would be a fine gift for fans of Griffith’s Zippy and other comics, for comics readers who like autobiographical comics, and for those who enjoy family dramas. I read it through my local library, but, as soon as I finished it, I ordered a copy for my own home library. It’s a keeper and a masterpiece. Minimum Wage Book One: Focus on the Strange [Image; $14.99] isn’t as heartwarming. Cartoonist Rob is now divorced from his beloved Sylvia and haunted by their failed marriage. He’s living with his mom while he recovers from the financial cost of the divorce, still drawing “adult” cartoons for skin magazines and trying to move on with his life. It is an effort that’s amusing, sad and, at times, uncomfortably real. Financial security comes with Rob landing an assignment to draw a popular comic book based on an animated cartoon. Emotional security is a little more difficult to achieve with Rob going through some dates from Hell, some unfortunate couplings and a sort of â€œfriends with benefitsâ€ relationship. Without going into detail, from my own blessedly well-in-the-past dating experiences, I find it very easy to relate to some of the above. More than in Beg the Question, Fingerman gives Rob more scenes with his friends, the people he works with and his mother. It gives us a much more complete look at Rob, which serves this graphic novel well. Focus on the Strange isn’t as good as the earlier work, but it’s a fine graphic album. I’m looking forward to future volumes. Minimum Wage Book One: Focus on the Strange is for older readers. It’s not all-ages friendly, but it would be a great gift for your comics friends who enjoy good characters and slice-of-life stories. It gets my high recommendation. I hope your holiday shopping goes well and that I’ve been able to help you navigate that quest a bit. I’ll be back next week with more reviews.